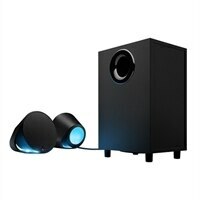 G560 Lightsync PC Gaming Speaker For All GamesEnjoy the latest games in living color. Logitech G LIGHTSYNC is next-gen RGB lighting. It’s powered by Logitech Gaming Software (LGS) and driven by games to synchronize with in-game action and controls of over 300 titles. Customize color for speakers at will from approx. 16.8 million brilliant colors. Even program your own advanced effects with LGS. Extend the game world into your room. Game developers work with our RGB SDK to program the color and animation effects for each game. That means the spectacular moments that the game creators focus on will be enhanced with RGB. Your favorite games. Brought to light. Choose any area on your monitor and assign it to any of the four lighting zones via Logitech Gaming Software (LGS). G560 then tracks in real-time and matches speaker lighting with the colors on screen. The result is stunning environmental lighting that immersing your room into the experience. See your music. Connect via Bluetooth, 3.5 jack or USB and the built-in G560 Audio Visualizer activates to bring your music to life. Low-volume response is a soft breathing effect. High-volume lighting pulses to the beat—rear lights take the bass and fronts take mids and highs. Connect via USB and use Logitech Gaming Software to customize lighting color and effects. The intensity you want and the edge you need from precise positional audio. DTS:X Ultra renders a 3D soundscape for games, so you hear your gaming environment from every angle. Also with DTS:X Ultra, multi-channel music sources such as 5.1 or 7.1 surround become a multi-dimensional experience. Each channel of the mix takes a unique position for heightened realism. Enhance your rig with a versatile, easy-access audio solution. G560 connects to and mixes multiple sources: USB, 3.5mm, and Bluetooth®. USB connection is required for true digital audio, LIGHTSYNC RGB, and DTS:X Ultra® surround sound. With Logitech Easy-Switch™ you can seamlessly switch between up to 4 connected devices. Game-driven lighting activates automatically. Just scan and add games in LGS and G560 handles the rest. With LGS, you can customize audio visualization lighting color and effects, as well as a screen sampler that reads pixels on screen and matches color dynamically. Choose any part of the screen and assign to any of the 4 areas: left and right, front and back. The G-key can also be programmed to activate custom commands for any applications. G560 serves as an audio control center as well. Volume control is front and center. Bluetooth pairing is done with the touch of a button. Programmable G-key cycles through color brightness by default and can activate anything from a special ability in-game to launching an audio application via LGS. The power button is also directly within reach on the back of the right satellite speaker.